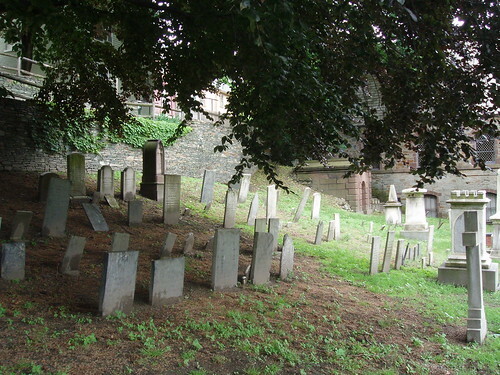 Today's post is dedicated to one of the spookiest, most atmospheric places I know, a spot perfect for visiting (virtually, if not physically) during Halloween: the graveyard of St. John's Episcopal Church in Providence, Rhode Island. To the right, do you see that dusty rose house overlooking the gravestones? From 1816-1863, that was the home of Sarah Helen Whitman, the poet and spiritualist with whom Edgar Allan Poe was enamored. In a 1934 letter, H.P. Lovecraft wrote: "The rear of this house overlooks the hidden churchyard of St. John's, where Poe used to wander on moonlight nights." 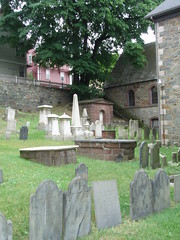 Lovecraft also described the cemetery in his story "The Shunned House": "I have reared a marble urn to his memory in St. John's churchyard - the place that Poe loved - the hidden grove of giant willows on the hill, where tombs and headstones huddle quietly between the hoary bulk of the church and the houses and bank walls of Benefit Street." According to More Annotated Lovecraft (edited by S.T. Joshi and Peter Cannon), "Lovecraft liked to take visitors to St. John's churchyard at night, one of whom, an attractive young woman named Helen Sully, because so frightened when Lovecraft started to tell her ghostly stories that she fled from the place." 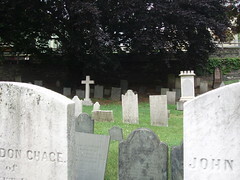 The graveyard also inspired Lovecraft's poem "In a Sequester’d Providence Churchyard Where Once Poe Walk’d." Be sure to note out the first letter of each line of the poem. ** My latest discovery is The H.P. Lovecraft Literary Podcast. Each episode discusses a specific Lovecraft story: what it's about, how it reads, why it may have been written, and what other works of art it's influenced. It's fun, thoughtful, and yes, a little creepy. What's not to love? ** There are many podcasts of old-time radio, but Vintage Horror Radio Podcast is the best in my opinion. This podcast shares the best of vintage radio programs that dramatized classic horror literature. This month the show is focusing on explorations of Edgar Allan Poe. Very appropriate! ** The Classic Tales is one of my very favorite podcasts. To celebrate Halloween, host B.J. Harrison is currently running some extra-spooky ghost stories by the likes of M.R. James and Sir Arthur Conan Doyle. ** The Atlanta Radio Theatre Company Podcast is always fun, and ARTC's most recent episode is their Halloween-friendly adaptation of H.P. Lovecraft's The Call of Cthulhu! ** The Cthulhu Podcast, a terrific podcast that highlights stories written and inspired by H.P. Lovecraft, is currently producing an unabridged reading of H.P. Lovecraft's The Case of Charles Dexter Ward. Spooky Text of the Day: Today's reading is short but chilling, ideal after a stroll in a graveyard: "The Vampire" (1920) by Jan Neruda, translated by Sarka B. Hrbkova. We breakfasted together and when the noon heat had abated somewhat we all betook ourselves to the heights, where in the grove of Siberian stone-pines we could refresh ourselves with the view. Hardly had we found a suitable spot and settled ourselves when the Greek appeared again. He greeted us lightly, looked about and seated himself only a few steps from us. He opened his portfolio and began to sketch. "I think he purposely sits with his back to the rocks so that we can't look at his sketch," I said. I need to check that out next time I'm in Providence! Burp! My Poe & Lovecraft-loving iPod thanks you for the podcast links . . . though I'm afraid it pigged out a little. Bad iPod. Aw, poor little iPod! *rubs its stuffed tummy* Hope you both enjoy. Wonderful! Thank you for the link. What a nice image... Poe wandering through a graveyard. Though I have loved his writings for decades, I confess I don't really know a thing about his life. I need to educate myself. Isn't it a lovely image? His wife was still alive when he was supposedly smitten with Sara Whitman in 1845! 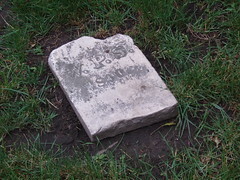 Virginia Clemm died in 1847. If I remember, though, he actually declined being introduced to her in person in 1845, and didn't correspond with her until 1848 - does that sound right? As long as he waited until she was cold.